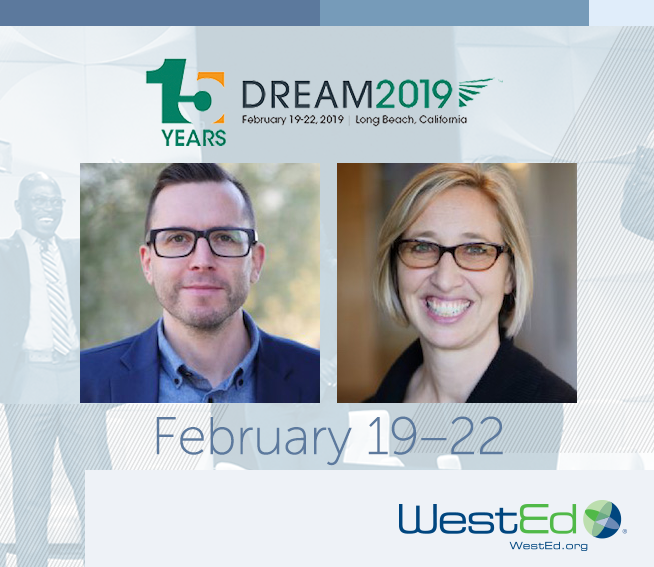 Join staff from WestEd’s Carnegie Math Pathways (CMP) at DREAM 2019, Achieving the Dream’s 2019 Annual Conference, February 19-February 22, in Long Beach, California. This year, Achieving the Dream will bring together over 2,000 policymakers, investors, thought leaders, and practitioners from colleges around the United States to examine emerging strategies for addressing important issues facing two-year and four-year colleges and universities. The sessions, workshops, plenaries, and keynotes will cover a range of topics, including equity, student supports, data, technology, and pathways. Karon Klipple, CMP Executive Director, and Lewis Hosie, CMP Instructional System Support Coordinator, will present this year, partnering with experts from the field. They will discuss the evolution of the pathways framework, meeting student needs, and digital learning. Add these sessions to your calendar and meet our staff. See CMP’s schedule of sessions and activities below. Please join us and our Guided Pathways partners for casual drinks and hors d’oeuvres! More than 350 colleges nationwide are using the pathways framework to redesign academic and support services to improve student and institutional outcomes. Many colleges have been at this work for several years, iterating and improving the comprehensive, integrated systems, structures and policies that enable all students to succeed. Members of the Pathways Collaborative, a group of organizations committed to improving rates of college completion, transfer and attainment of jobs with value in the labor market, will share key outcomes, metrics, and learning about pathways implementation across institutions and states. They will also identify the ongoing challenges and opportunities for higher educational institutions to redesign the student experience more effectively and equitably. Can educators help math students answer the age-old lament, “When am I ever going to use this?” One critical step to making math learning relevant and meaningful to students is through math pathways course designs that incorporate critical learning processes in the curricular design, active instructional methods, and integrated student supports. Implementation of the Carnegie Math Pathways isn’t a simple out-of-the-box solution. Instead, it is offering a set of tools and resources designed to help instructors present meaningful learning content to students with the flexibility to adapt the implementation to specific cultural, regional, and community contexts. Join us for a session that will feature case studies from faculty at three tribal college campuses. The examples in this workshop will provide participants with ideas and strategies that they may, in turn, use and adapt to improve instruction in their classrooms. Ideas for implementing math pathways courses will also be addressed. WestEd and Northeast Wisconsin Technical College (NWTC) both recognize the importance digital learning has on transforming the learning experience. This presentation will look at the strategy NWTC is adopting to increase access to educational experiences and resources, remove barriers to learning, extend support opportunities for remote students, and reduce student costs through Open Educational Resources/Subscription textbooks. WestEd’s Carnegie Math Pathways will explore a real-world application of digital learning in mathematics, showcasing how real collaborative learning, adaptive learning, and data-driven socio-emotional interventions in a digital course can be a reality for entry-level mathematics students in the online space.